"Northern Soul", like Catholicism, is one of the hardest concepts to define, forever snaking its way out of your grip just as soon as you believe you've got the whole affair firmly nailed. 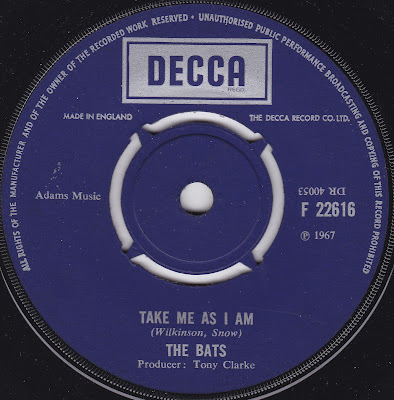 Rather as the Vatican appear to sit and reinterpret matters now and then, so too do the divine faithful at the Soul Weekenders up and down the country, leading to some rather rum records landing on official (and unofficial, disputed) discographies. Is Count Five's "Psychotic Reaction" a Northern Soul record, for example? Not by my estimation it isn't, but that doesn't seem to have prevented some people from taking that line in the seventies (I have a bootleg repressing of the disc on the "Sound of Soul" label). 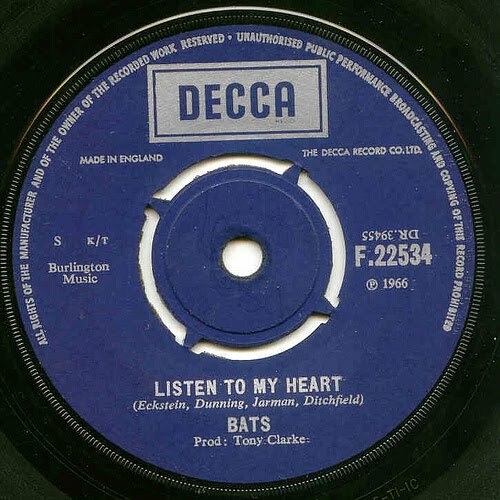 Nestling neatly on the Decca compilation "Northern Soul Scene" is a single by this South African band, The Bats (they're not Irish as the liner notes state). It only fits the genre due to its pounding, jogging rhythms, chiming piano lines and finger pops, but whether we're arguing about its standing in the official list or not, it's still a damn fine track. Effervescent, insistent and absolutely loaded to the brim with hooks, it's hard to understand where the chorus starts and the verses begin - listening to this record would inspire movement in even the most dancefloor shy of humans. Sadly, I haven't been able to include a clip of it in full, but it's available to buy on iTunes if you're that way inclined. 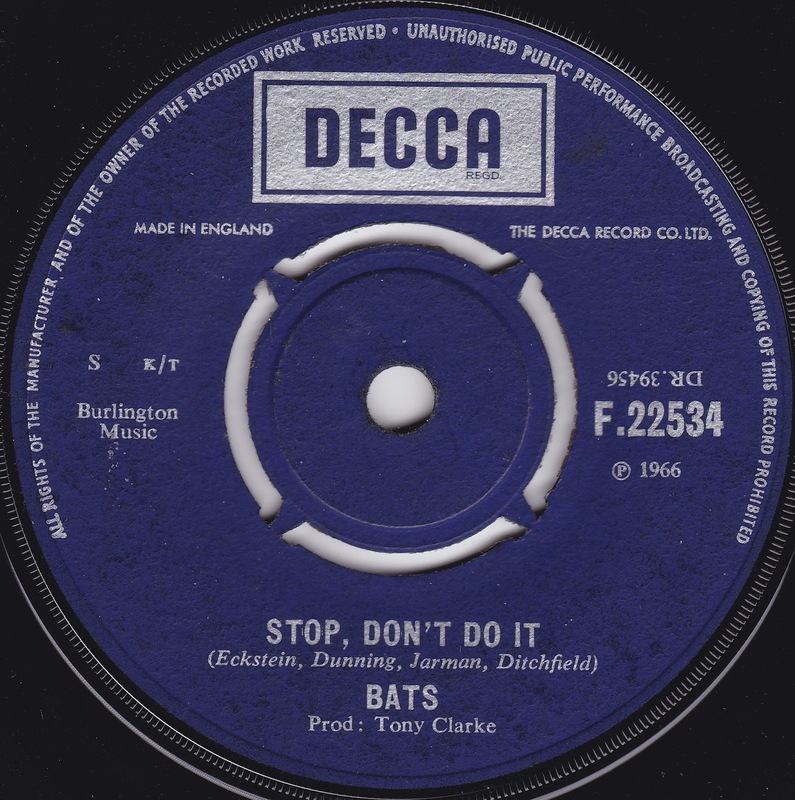 Truth be told, the B-side "Stop Don't Do It" is pretty good in a mod-pop way as well, and it remains a massive mystery why this record didn't chart in the UK. It's pure, absolute pop, being neither ahead of its time in its stylings nor awkward, and the start of a career should have been assured for the band. Sadly, it was not to be. So sadly, then, by the tail end of 1967 the game was up, and "It's Hard To Get Up In The Morning" was their final UK single. This is an entirely different proposition and sounds rather like a slice of bouncy, McCartney inspired whimsy - sweet and pleasant enough, but hardly the barnstormer "Listen To My Heart" is, nor powerful enough to have stood a chance in the charts. 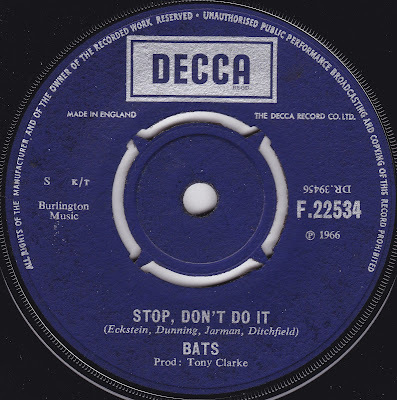 What became of The Bats when this failed to do the business isn't clear to me, but if anyone has any information, please come forward. They deserve masses of recognition for their one club classic at least. Not to be confused with the NZ band of the same name, from the 80's to now.